Below are some common, yet critical, archery safety rules. Please make sure to go through them and preferably print the list and keep it handy – give it a read once in a while when you have a minute or too and you’ll internalize everything very quickly. Never point your bow at anyone, even if there’s no arrow drawn (this is important for creating proper shooting habits). Never fire the arrow high into the air as you cannot predict where it’s going to land. An exception is when you’re participating in a flight archery competition. Keep your arrow aimed towards the ground as you nock it. It’s strongly recommended that you wear an arm guard. Never draw an arrow if there are any people between you and your target, even if you don’t intend to shoot yet. Never over-draw your recurve bow (over-drawing is when you pull the string further than the actual length of your arrow). This can result in serious injury and damage to your equipment. Always use a bow-stringer when stringing your bow. 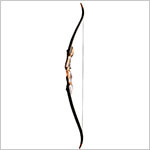 If you are using wooden arrows, always check them for cracks or splintering before your shooting session. 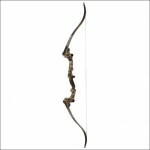 Make it a habit to always check the bow limbs for any damage before you start shooting. If you notice signs of wear on the string (for example separation of the string serving), replace it immediately – do not wait for it to become completely non-operational. Take off your watch and/or jewelry before you begin shooting. Make sure your cellphone battery is charged so you can call for help in case an accident were to occur. 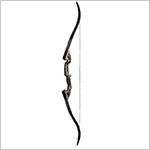 Finish each shooting session by un-stringing your recurve bow. Never dry fire your bow (pulling and releasing the string without an arrow seated); this will be dangerous to both you and your recurve. Listen carefully to commands given by your instructor. If you can’t hear them, ask the instructor to speak louder. Make sure the range you shoot at has a first-aid kit. If they don’t, let them know they should have one and don’t visit them until they buy it. Never approach the shooting line if you haven’t inspected your bow/arrows/string for any damage. Never run while retrieving your arrows; you could hurt yourself with an arrow lodged in the ground, or fail to stop in time and hurt yourself with the arrows lodged in the target (yes, it happens). Keep standing behind the shooting line and never cross it until the instructor gives a clear command for everyone to stop shooting. Do not nock or draw an arrow unless you are at the shooting line and unless the instructor has given everyone the command to do so. If you drop anything in front of the shooting line, even if it’s within reach of your arm, do not retrieve it until the command has been given for everyone to stop shooting (usually “bows down” or “all clear”). Make sure no one is standing immediately behind you when pulling out an arrow from the target, as you could accidentally hurt them when forcefully pulling the arrow out. If one of your arrows travels too far and lands behind the target, make sure your instructor is aware of this as you go to retrieve your arrows once the “all clear” command has been given. If you hear the command “HOLD,” do not shoot an arrow even if it’s already nocked and the bow is drawn. Hope you find this helpful, and if you think we’ve missed something, do leave a comment below. And please consider sharing this article with your friends using the social buttons below if you found it useful. Thank you and stay safe. Hey, I was wondering why you’re supposed to unstring the bow after each use. Also, what’s the best method to do so? You didn’t cover that in the Restringing section. i dont get that because i go to an archery club in bedford and they say we have to wax our bows after every use. Hi, i would like to know if there is any restriction of a bow and arrow on a performance stage? We’re currently doing a film about the love a girl (she’s 12 years old) has for archery – and we have a scene where she does a performance piece and draws the arrow through an apple on top of someone’s head. Hence, I would like to know about this. what should you wear during archery? If you must show an arrow in a apple, go ahead, just don’t actually let it fly anywhere. A good glove, bracers, long sleeves aren’t a bad idea either. I never would’ve thought about keeping your phone charged for any emergencies while you are shooting. My brother is a very big advocate for archery, and I am going up to the mountains with him over the weekend to shoot targets. I will be sure to have a full charge on my phone for when we go! Thanks for pointing out that it is advisable to never draw an arrow even if you are not about to shoot especially when there are people near or between you and the target. I will share this information with my cousin to keep himself and the people around him safe. This is because he will be buying archery gear this weekend to start a new hobby since he became interested in it after watching a famous movie. Since they have a woodland, he can have somewhere to practice as well. this research was for school thanks for the information.